Leicester-based Digital Wordcrafts has extended the capability of its print room with the addition of a new Mimaki JV5-320S 3.2m-wide solvent printer, which has provided it with both the extra width and capacity required to handle larger work. The company bought its first Mimaki wide-format printer four years ago and over time has built up a print portfolio comprising a Mimaki JV34, two Mimaki JV33 machines and now the Mimaki JV5-320S. The new printer, only the second of its type to be sold in the UK, was installed in October by Mimaki UK reseller i-Sub Digital. Digital Wordcrafts has also recently used the JV5-320S to complete a similar job for HSBC: a 3m x 4m backlit display for use in a branch of the banking chain, something which, claims Adrian, would previously have been unachievable. 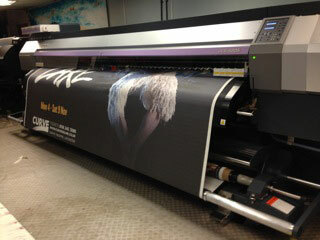 Using Mimaki SS21 class-leading solvent inks, the Mimaki JV5 can print onto a range of media, including textiles, canvas, films, vinyl, banner PVC and papers. 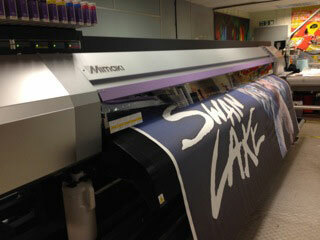 Its four printheads offer fast speeds and outstanding quality, with resolutions of up to 1440dpi. i-Sub Digital is currently offering an enhanced deal on other printers in the Mimaki range. Existing owners of Mimaki CJV30-130, Mimaki CJV30-160, Mimaki JV33-130 and Mimaki JV33-160 solvent printers, working or not, can trade them in for a new printer and receive a three-year Gold Warranty and £1,800 worth of ink. For further information on Digital Wordcrafts visit: www.wordcrafts.co.uk. PreviousSwap the oldest for the newest!